When it comes to trail cameras, Browning Range has always offered several high quality lines that work according to expectations set forth by their founder many years ago. The Browning Range Ops XR is certainly one of them, incorporating quality workmanship and materials along with ingenuity in design. To find out what makes this trail camera truly top rated, here are the outstanding features it comes with. Delivering big performance in a compact profile, the Browning Range Ops XR comes with a compact case size of 5” x 4” x 2.5”, so it can virtually be held in the palm of your hand. The small size makes the unit easy to store along with your other gear when not in use, and to pack it along with everything else when you’re ready to install the device. This trail camera is built durable, ensuring that it can be left outside for the hunting season and be able to handle what the elements throw at it, as it is geared to be weather resistant. This model carries an impressive camo finish, making it undetectable by animals as well as other people. Hang it next to a food plot or bait station and stay confident that it’ll keep doing its job without spooking the deer. Easily blending along with the rest of the environment, this trail camera comes with a ¼-inch-20 tripod socket for mounting on a tripod when you want to observe the animals from a certain location. Having to do frequent battery replacements on a trail camera can be tiresome. This is compounded by the fact that you could easily leave your scent on the site and thus alert the deer of your presence, which may turn them away from the location for good. This is an issue that the Range Ops XR provides a solution to. This trail camera provides long battery life under normal use. Able to maximize the use of a set of 8 double-A batteries, this impressive piece of hunting device can be left to do its job outdoors and will not require you to come back every so often to change the batteries, which is perfect since you don’t contaminate the site with your ‘foreign’ scent and thus keep the animals visiting the food plot or bait station so you can plan your next move. The unit ships with a 12-volt external power jack for effortless charging of rechargeable batteries. The trigger time for this model is lightning fast at just under a minute–0.67 second to be exact. That means the camera won’t take too long to wake up, and will immediately capture an image as soon as motion is detected. The 60-foot flash range ensures there’s decent illumination to snap good and usable photos that you can study. Able to record videos in high definition and along with sound, this trail camera can deliver moving pictures lasting between 5 seconds to 120 seconds long so there’s more footage for you to observe the behavior of the wild game. There’s no denying the usefulness of time lapse shots when studying patterns of behavior, and the Range Ops XR is engineered to make the most of that kind of technology via its Time-Lapse Viewer Software. The system offers a full day’s worth of activity compressed into just a few minutes of activity so you can take note of the most vital aspects of an animal’s behavior from dusk till dawn. This gives you something concrete on which to base your hunting plans so you’ll be there waiting when your dream buck shows up for its usual routine. Able to record high definition videos, this camera is equipped with an awesome 8MP picture resolution so you get great quality photos of the wild game, day or night. The HD video clips offer terrific surveillance footage. The infrared LED illumination is designed for optimal nighttime use. 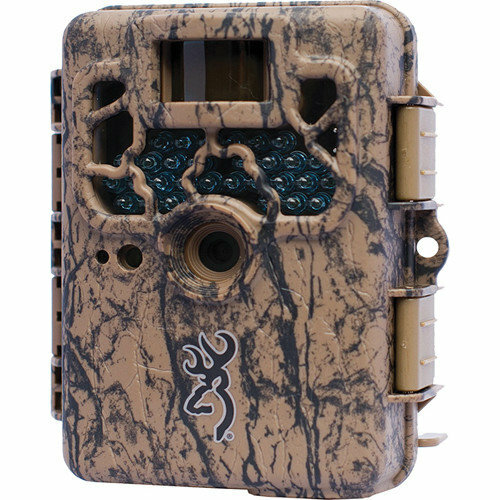 The trail cam takes up to 8 multi-shot images and up to 4 rapid fire images so you are never out of shots. The picture info bar lets you view the time, temperature, date, moon phase and camera ID so you can do tagging of the perfect location to catch your prey. The TV out and USB port allow you to share gathered images and video on a large screen TV with your friends, or to store the data in a PC or storage device. You can even program the camera for picture delay between 5 seconds and 60 minutes to conserve on power. Able to support up to 32GB SD card, this trail camera has immense storage capacity to hold a large number of videos and photos.